The Publish menu is selected from the File menu and provides selection of the output choices. video is only available for PE+ and WD+ products. A slide show must be active or the Publish options will be unavailable. 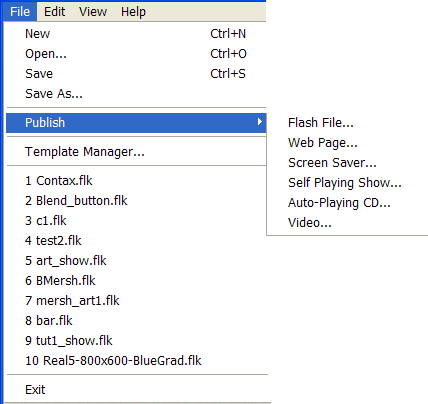 The File menu with Publish selected is shown below. Click on the link for each category for more information on the topic. Screen Saver Creates a and optional installs a screen saver from the slide show. The screen saver is "packaged" a self extracting exe file which may sent to others for installation on their systems. Self Playing Show Creates an slide show movie with it's own stand-alone viewer that is created as a self extracting .exe file that can be sent to others for viewing. Auto-Playing CD creates a standalone Self Playing Show and an auto run file (Auto.inf) that is set up to play the Self Playing show containing the slide show.